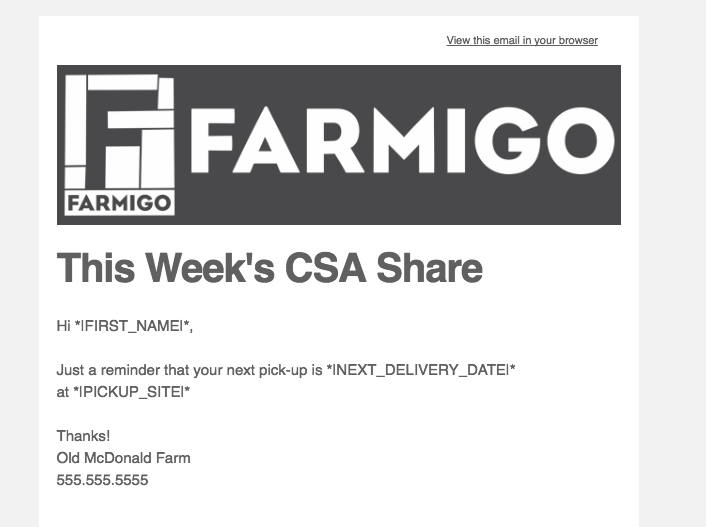 With the Farmigo Dashboard you can send templates created in Mailchimp with the add-on Mandrill. Mailchimp is an email provider with a variety of options to suit your business needs based on the number of email subscribers on your list. You will need to create a paid Mailchimp account to add the Mandrill extension. Once your Mailchimp account is set up with the Mandrill Add-On and connected to your Farmigo Dashboard with through the API, you can create Mandrill templates to send emails, automatic alerts, and some of the Automatic Responses sent through the dashboard. ﻿﻿Once your account is created, you can add the Mandrill add-on. Mandrill starts at a monthly fee, but you will be able to sign-up for a free trial with a paid account. You can add Mandrill to any existing Mailchimp account. Mandrill is also a powerful tool for tracking stats on your marketing emails such as monitoring open rates, statistics on mail sends, and much more. You can connect your Mandrill Account by copying and pasting the key from your Mandrill account into the dashboard. First, locate the key in Mandrill, then copy the number. The key is located under the Settings section of your Mandrill account. 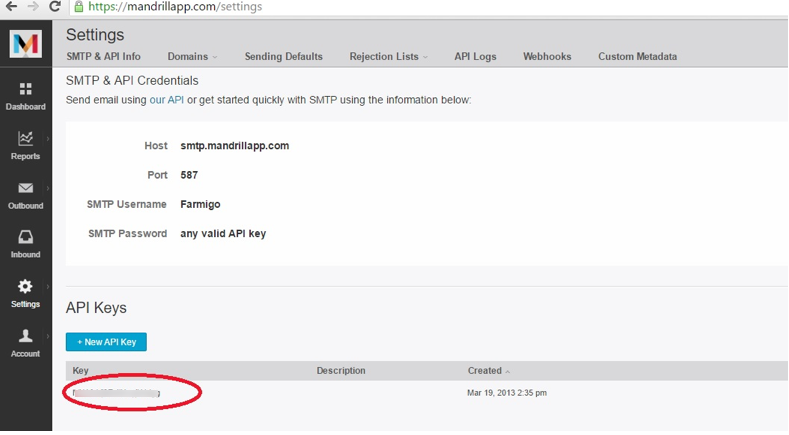 Copy the key, then open the dashboard and go to Settings --> General Settings --> Mandrill API Key. Click edit in the right hand corner, then paste the key in and push save. Now you're ready to start using your Mandrill Templates! The simplest way to create templates to send through Mandrill, is to use the Mailchimp drag and drop templates, then when your template is created, click "Save and Exit". Go to the templates list, and then in the drop down to the right of the templates menu, select "Send to Mandrill". Use the list below to copy and paste the relevant dynamic fields from the dashboard right into your template. (Only copy the *|FIRST_NAME|*) The fields will autofill from the member's account just like they do in the Farmigo Email Editor. Click on the template, highlight the title, and right click to copy. Now that you've created your template in Mailchimp and sent it to Mandrill, the last step is to connect it to the dashboard. You can skip the email editor completely and go straight to the Members filter to send your message. To use the template you created in Mandrill, go to Members and filter the group you would like to message, then click the "Email Members" button. To message all of your members, go to Members and push "Find". To message a specific group, set the appropriate filters, then push "Find". Click here to learn more about how to use email filters. Check the box to use the Mandrill Template, then type or copy and paste the exact name of the Mandrill template into the system. The system will send the email template you created in Mandrill.